Why have one shower when you can have four? 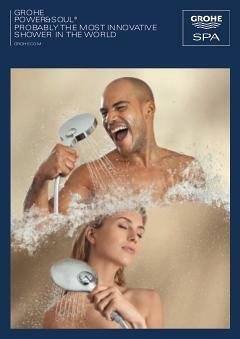 The Power&Soul 190 shower system with thermostat has a different spray to suit every mood, from relaxing to revitalising. The one-click spray selector lets you choose and combine the 4 different spray patterns for total flexibility: there’s a gentle Rain Spray, air-infused Rain O², a powerful Jet spray and the pulsing Bokoma Spray. Thanks to GROHE DreamSpray technology you can be certain of an even flow from every nozzle, while the GROHE TurboStat thermostat ensures a constant temperature throughout. Families will love two great safety features – the GROHE SafeStop button which can limit the temperature to 38°C to prevent scalding and GROHE CoolTouch technology which means the tap never gets too hot to touch. Plus the dazzling GROHE Starlight stainless steel finish is scratch-resistant for a sparkling surface that last for years.